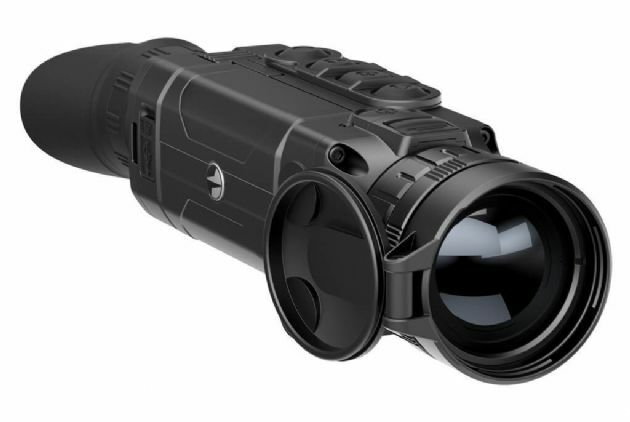 The Pulsar Helion XQ38F thermal imager features a 17µm 384x288 thermal core, providing a detection range of up to 1.35km. Combined with the latest wifi and integrated video recording technology the Helion XQ38F thermal camera provides fantastic performance, with a 3.1x to 12.4x magnification. The Helion XQ series features a 340x288 17µm thermal sensor and is available with three different lenses; 19mm, 38mm and 50mm. A heat sink, located on the device's body, effectively prevents heat build-up from the sensor and other components while also significantly reducing temperature and noise sensitivity - especially between calibrations. At a high refresh rate of 50Hz, the Helion series provides comfortable viewing throughout dynamic, rapid motion. Depending on the model, Helion thermal imaging scopes can detect man-size heat signatures up to 1800 metres away. The highlight of the Helion is the ability to link the device via Wi-Fi with Android and iOS based mobile units using the free mobile application, Stream Vision. The Stream Vision software connects the device with Android/iOS devices, which enables you to receive footage in real-time mode, to distantly operate the device with your smartphone and to stream the footage captured by the device to direct straight through to Youtube. All Helions include a progressive autonomous B-Pack power supply consisting of a quick-detach, rechargeable IPS5, 5.2A-h battery pack designed to deliver up to 8 hours of operation. Higher-powered IPS10 battery packs, CR123A and AA battery cases are also available and provide a perfect off-grid power solution. The Helion is designed with ease-of-operation in mind. User feedback has resulted in the most user friendly interface to date, complete with an easy-to-read, icon-driven, alpha-numeric status bar at the bottom of the display. Internal menu items and options are also displayed on a contrasting gradient substrate, so that you can keep an eye on settings, without losing sight of your objective.